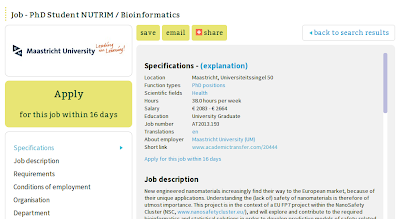 I am happy that I got my first research grant awarded (EU FP7), which should start after all the contracts are signed etc, somewhere early 2014. The project is about setting up data needs for the analysis of nanosafety studies. And for this, I have the below two position vacancies available now. 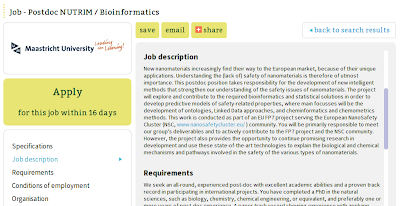 If you are keen on doing Open Science (CDK, Bioclipse, OpenTox, WikiPathways, ..., ...), working within the European NanoSafety Cluster, and have an affinity with understanding the systems biology of nanomaterials, then you may be interested in applying. Click the screenshots for full details.